The Basics: The Volkl Organix 8 can give your game a nice combination of balance AND power. Whereas the V1 Mid Plus is a comfortable racquet with low weight and a subsequent loss of power, the Organix 8 gives you the same comfortable feel, but with the added ability to create some heat. Forehand: My current racquet has an 18×20 string pattern that allows me to better control my natural ability to sometimes create more topspin than I can handle. 16×19 string patterns can be a challenging. The Organix 8’s 16×18 feels like a nice compromise to help control the spin. 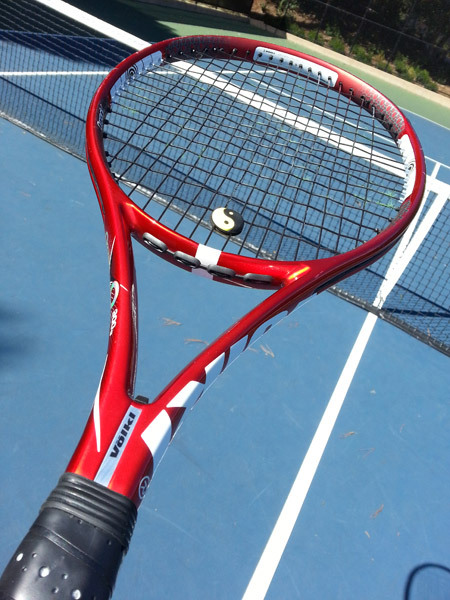 Though this racquet provides for more pop on my forehand, it still performs best with an easy swing. Whenever I tried to “punish” the ball, my results were inconsistent shots that sometimes went long. If I gave it a strong hit with a relaxed arm, the results were solid shots with great depth and spin. Backhand: My two-handed backhand shots were comfortable, and the racquet allowed for good spin. Again, relaxed shots were best so that the ball didn’t get away from me and go flying long. Slice shots were a little prone to pop up without a good forward motion. However, a good stroke produces a nice “knifed” effect. Serve: The 16×18 string pattern allows for an easy ability to slice or kick the serve. The main challenge I had with this racquet was more in terms of keeping a relaxed swing so that the power wasn’t too much to handle. When I was successful at relaxing the arm, my serve was untouchable. When I wasn’t as successful, the double faults flowed freely. 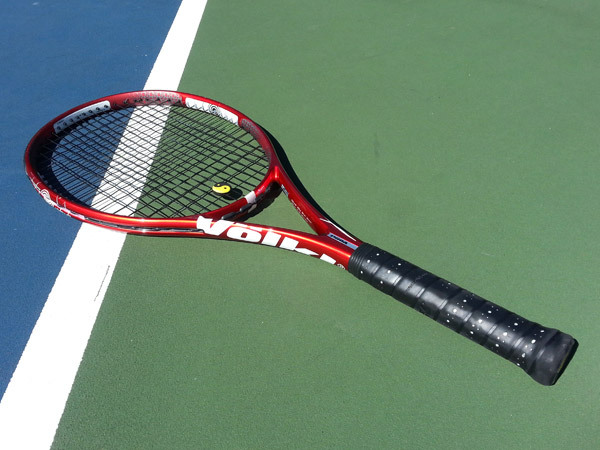 Volleys: Volleys were fine, and the racquet’s dampening technology helped keep vibrations to a minimum for a nice solid feel. Overall: The Volkl Organix 8 (300) is a nice racquet that, if I had the spare cash, I’d buy to put into my bag for rotation with my HEAD sticks. One point that I played in a doubles set stands out memorably to illustrate the benefits of this racquet. While receiving a wide serve on the deuce court, I was able to get a forehand on the ball with some spin even though I was stretched way out. The net man volleyed my return back into the deuce box for what would surely have been a winner if not for the lighter weight and substantial power of the Organix 8. I got back into the court in time to hit a solid slice. Though the ball was slightly behind me, I was able to get the racquet on the ball and give it a good wrist flick for added “oomph”. The knifed slice stayed low, and was too tough for the net man. He missed the volley and we won the point for a break. That type of shot wouldn’t have been possible without the maneuverability and power of this racquet! 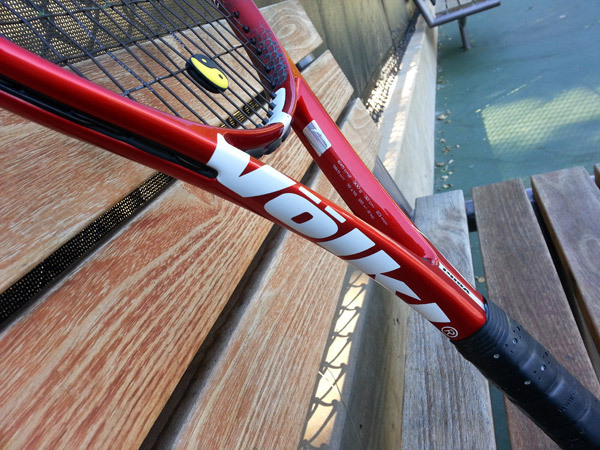 So if you’re looking for a lighter racquet that’s comfortable with good control AND power, give this baby a shot. I think you’ll be pretty happy with the results.